The Playcraft Deluxe Shuffleboard Weight Set. A $250 value for only $174.99 – buy it now! Playcraft is a leader in the shuffleboard market, and their pucks are no exception. 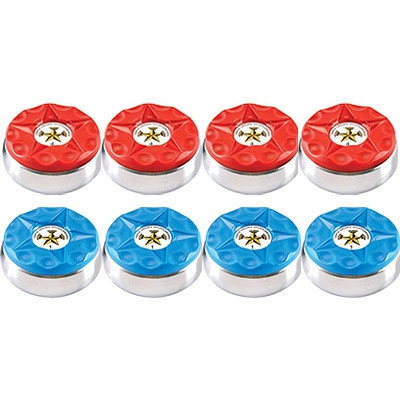 These deluxe pucks are chrome plated and capped with dimpled plastic for easy gripping. They are ideal for shuffleboards that are 15” wide and 14’ feet long or shorter. An 8 piece shuffleboard weight set. A $200 value for only $139.95 – buy it now! 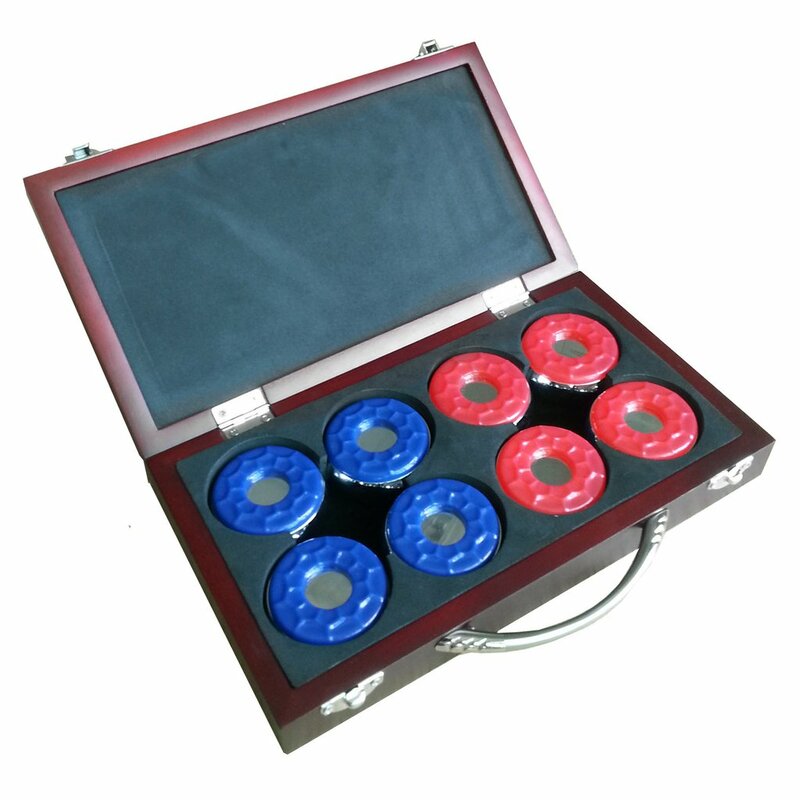 This set of weights comes in a sleek wooden carrying case for easy storage and transportation.The pucks themselves are made with a dimpled cap that makes them easier to grip and a beveled edge that gives the player more control over their shot. They weigh in at 9.5 ounces, making them ideal for shorter game tables. A close up of the Venture Alumi Cap Weight Set. A $500 value for only $350 – buy it now! These weights from Venture are the finest pucks on the market. The sleek alumicaps are made of Builit Aluminum then anodized with the traditional red and blue, a process that gives them their eye-popping sheen. These regulation-size weights are perfect for the ultimate shuffleboard fan in your life. Triple Crown, known ubiquitously for their shuffleboard wax, makes these excellent shuffleboard weights. A $289 value for only $199 – buy it now! Triple Crown weights are sleek, stylish, and sophisticated. Stand out with the star-shaped design on the nylon cap that sits atop chrome-plated hardened steel. These weights can be ordered in three speeds (slow, medium, and fast), depending on your skill level—you’ll want the fast ones if you plan to use them in tournaments. 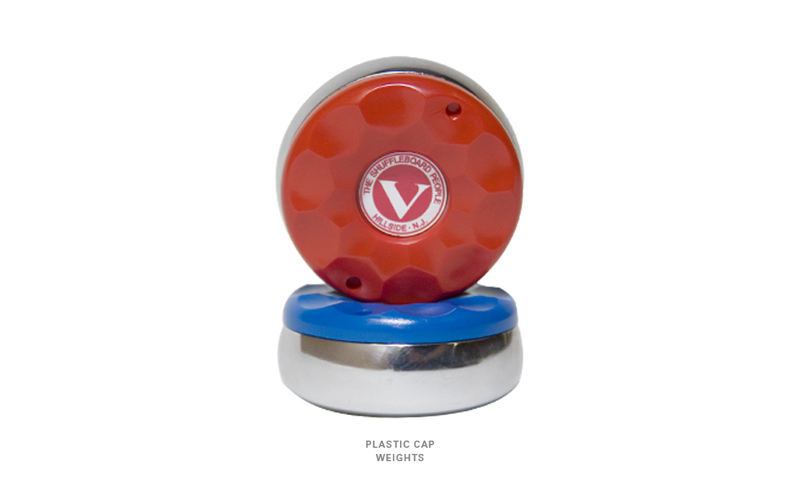 Venture makes these great regulation size shuffleboard weights. A $271 value for only $190 – buy it now! Like the medium size version from Venture, these regulation size weights are crafted with precision right here in the USA. They are built to last, having been hardened, chromed, and finally polished by hand according to the precise Venture method. The Pro Series is a more economical set of regulation size shuffleboard weights. A $250 value for only $175.95 – buy it now! The name speaks for itself with this set of shuffleboard pucks topped with high-quality ABS caps. These heavy, chrome-plated steel pucks were designed and tested for precision on all playing surfaces, from lacquer to poured polymer. The pucks come in a felt-lined wooden carrying case for cushy storage and transportation. The Playcraft Regulation Shuffleboard Puck Set is great for those that are looking for an entry-level set of weights while on a budget. A $256 value for only $178.99 – buy it now! These premium steel pucks from Playcraft are regulation size for competitive play. Like the deluxe pucks, these weights are chrome plated and expertly crafted to provide the player with just the right amount of grip. 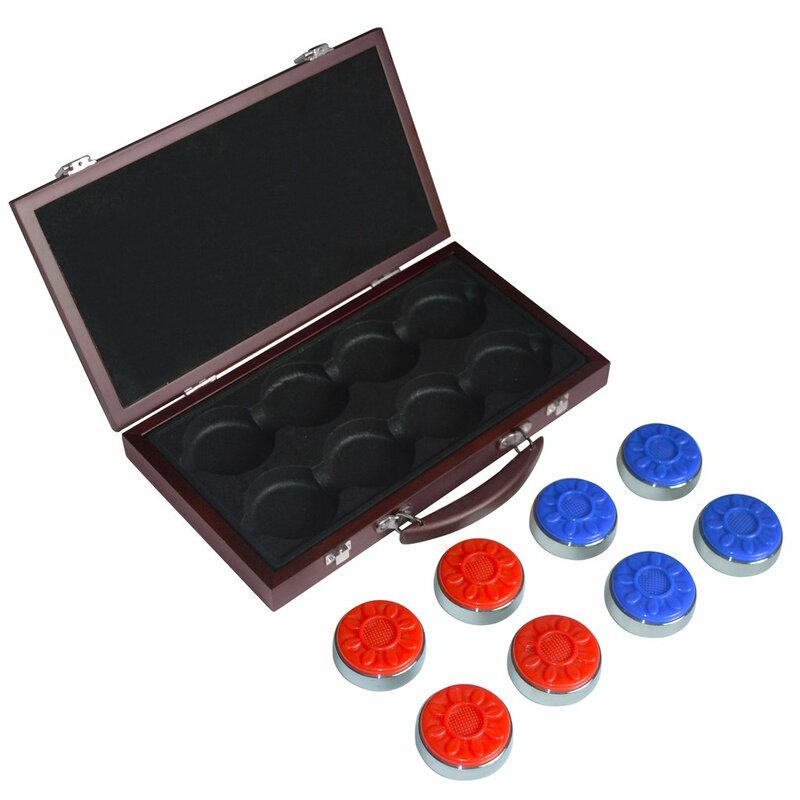 Because these pucks are made with tournaments in mind, they come with a wooden carrying case for convenient transportation to and from the competition. 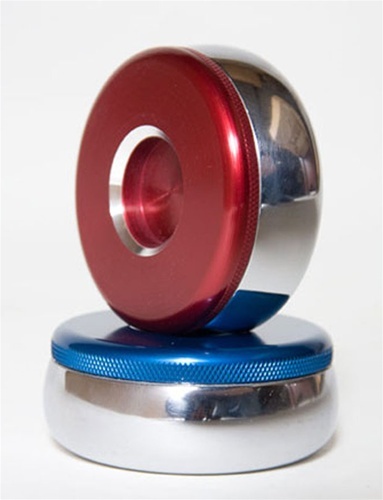 Once you’ve found the perfect shuffleboard pucks for your table and skill level, be sure to stock up on other shuffleboard accessories from Shuffleboard.net. We offer free shipping and the best prices on the web.